View More In Food Processor Parts & Accessories - Page 4. 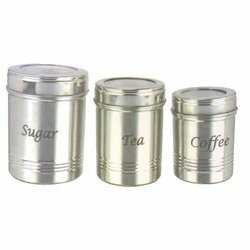 3 piece set of canisters / kitchen storage made up of stainless steel and being very high quality and extremely durable and rust free. Having mirror at the top helps to see through the items easily without opening the same. 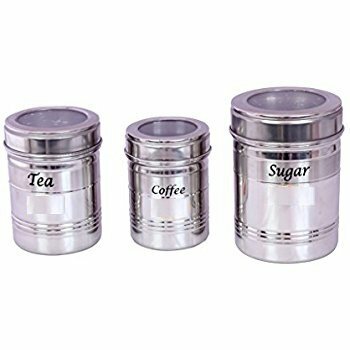 Stainless Steel Dabba Sizes-Sugar dabba-Diameter-3.5 Inch Height-4.5 Inch , Tea Dabba -Diameter-3 Inch Height- 4 Inch ,Coffee Dabba-2.25 Inch Height - 3.5 Inch with Transparent At The Top. If you have any questions about this product by EastWest, contact us by completing and submitting the form below. If you are looking for a specif part number, please include it with your message.